Our Native American studies teachers encourage our male students to learn the Lakota language through drum group. [The Lakota language] is dangerously close to extinction. Recent linguistic surveys and anecdotal evidence reveal that there are only 2,000 first-language Lakota speakers remaining, on and around the reservations of North Dakota and South Dakota. This number represents less than 2% of the total Lakota population. Today, the average Lakota speaker is 65 years old. These existing speakers are dying and are not being replaced by new Lakota-speaking generations. St. Joseph’s recognizes and understands the importance of the Lakota language to the culture of the Native American children we serve. In 2015, St. Joseph’s Indian School joined forces with the Lakota Language Consortium to help save the Lakota language and preserve this rich culture for generations to come. At St. Joseph’s, children in grades one through eight attend a regular Native American Studies class where they learn the Lakota language, as well as their cultural traditions and proud heritage. 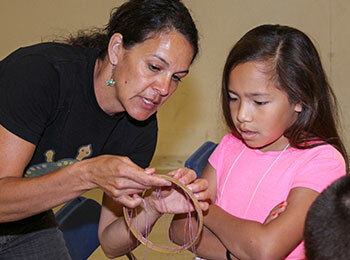 Boys and girls are led in their Native American Studies programs by enrolled tribal members. St. Joseph’s curriculum is rooted in culture and dedicated to helping children find understanding and healing through education. Our Native American Studies teachers work hard to preserve the Lakota language and traditions. 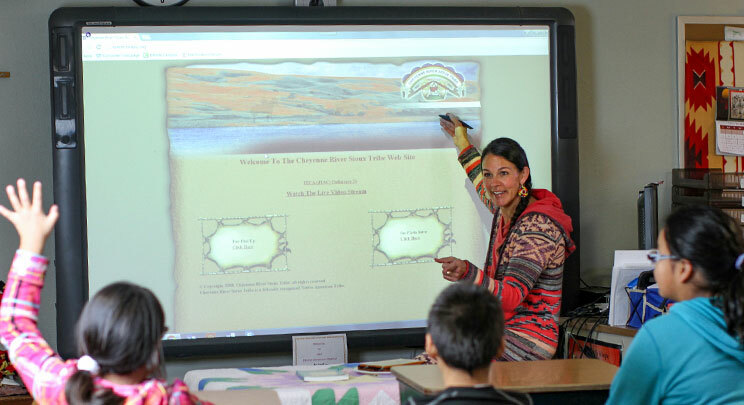 In addition to Native American Studies classes, classroom teachers strive to include the Lakota language and culturally appropriate material in regular curriculum. Our Native American Studies staff is working with classroom teachers and other school staff to label objects throughout the school, further incorporating the Lakota language within the school environment. Each school morning also begins with prayer, singing of the Flag Song, weather announcements and the “Phrase of the Week” — all in Lakota. Each week’s phrase is chosen specifically for meaningfulness and usability in daily life. To encourage the use of Lakota language throughout the day, students receive a ticket if they are able to use a Lakota word/phrase in correct context during the school day. Each Friday, tickets acquired throughout the week are entered into a drawing for prizes. In St. Joseph’s residential homes, Lakota language posters and commonly used phrases are posted to encourage our students and houseparents to interact in Lakota. Our houseparents and students enjoy this process. At St. Joseph’s we are always looking for additional ways to incorporate more culture and language into the home setting. For the past year, our Native American Studies teachers have periodically hosted Lakȟólʼiyapi Wóglaka — Speak Lakota — an opportunity for St. Joseph’s staff to learn the Lakota language. Through this Lakota language class, our staff become better equipped to incorporate the Lakota language into their daily conversations. Pilamaya — thank you — for walking alongside us as we encourage our students to keep their Lakota language and culture alive.